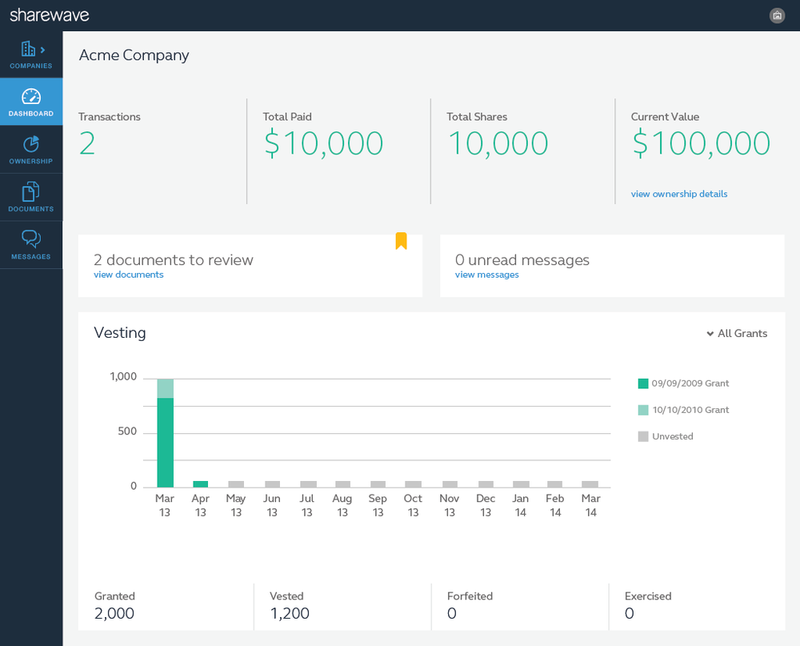 Sharewave (now Gust Equity Management) is a business tool designed to help users simplify their business paperwork and help them build their business. Keeping track of a private business' capitalization table, documents, shareholders and outside business consultants is confusing and time consuming. Sharewave was created as a business tool designed to help users simplify their business paperwork and help them build their business. First, the team identified the core business needs: ownership and its paper trail. Second, we needed a way to connect those needs. Finally, we aimed to support the shareholders and optionees by giving them a platform to view their ownership. The resulting design is a one-of-a-kind platform allowing everyone involved with a business to connect, collaborate, and share information. The centerpiece of the product is its capitalization table. The table allows the business owner to keep a complete history of their company ownership, from initial setup to IPO. Every transaction can be supported by legal documents, and are easy to adjust later. When exploring how the user can view or edit a cell's terms, we explored popup modals; separate pages; and a right rail drawer. The right rail drawer allows the user to navigate the spreadsheet and top-tier information while actively editing the terms associated with the cell. The cap table supports complex financing options and automatically updates. Modeling calculations with visual representations were created to allow companies to anticipate how new rounds of financing would affect their current ownership. 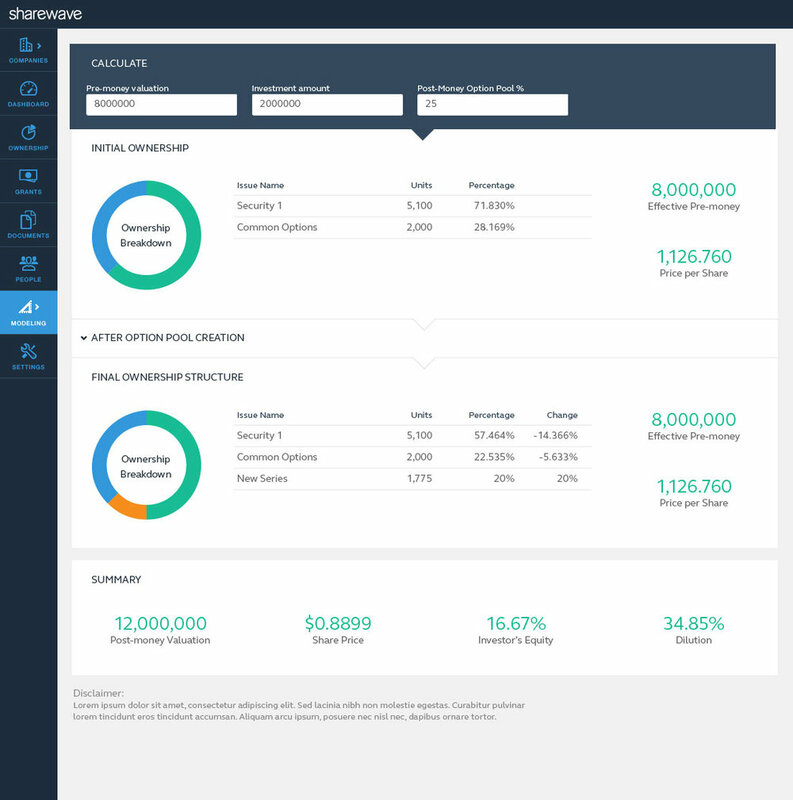 User dashboards all companies to be in control of the access to their business information while allowing shareholders to see only select data. The dashboards also incorporate alerts, such as documents to approve and messages received. Established word mark with prospective logomarks to allow more flexibility within platform and in anticipation of mobile apps.